Former Methodist Chapel, built in 1884 and used until 1979, when it was bought for its present purpose by St Leonard's Church. Please use Back Lane car park, just a short stroll away down Conduit Lane, if you need to travel by car. 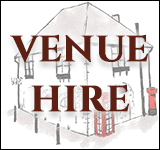 This is a busy and popular venue, regularly used by many groups, young and old, from the village and further afield. The main area accommodates up to 80 people, with a well-equipped kitchen and a walled garden at the back.